It’s 1876, and Charles Lenox, once London’s leading private investigator, has just given up his seat in Parliament after six years, primed to return to his first love, detection. With high hopes he and three colleagues start a new detective agency, the first of its kind. But as the months pass, and he is the only detective who cannot find work, Lenox begins to question whether he can still play the game as he once did. Then comes a chance to redeem himself, though at a terrible price: a friend, a member of Scotland Yard, is shot near Regent’s Park. As Lenox begins to parse the peculiar details of the death – an unlaced boot, a days-old wound, an untraceable luggage ticket – he realizes that the incident may lead him into grave personal danger, beyond which lies a terrible truth. With all the humanity, glamor, and mystery that readers have come to love, the latest Lenox novel is a shining new confirmation of the enduring popularity of Charles Finch’s Victorian series. 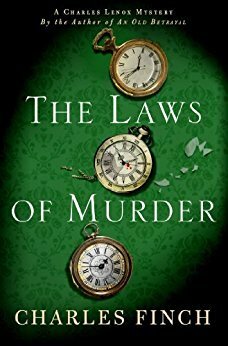 This book, The Laws of Murder, is part of the Charles Lenox series, by Charles Finch. This series is one of my favorite mystery series. The plot and story are great without the graphic details. Another great book in a great series.